Does DeGale need a new trainer? By William Mackay: Both James DeGale and George Groves looked lost out there last Saturday night. Two fighters with domestic level skills trying to find their way around the ring and looking pretty amateurish for the most part. With that said, Groves at least looked like he had a plan and stuck with it. His team came up with what turned out to be a good strategy for him to use a lot of moment against the plodding DeGale it ended up working for Groves. It probably was the main reason for the victory, because Groves really didn’t look good when he would stop moving and stand in front of DeGale last Saturday. DeGale usually did the better work and looked like the much stronger and better fighter when the two were fighting toe-to-toe. But what you have to wonder is the lack of planning for DeGale. He seemed as if he had no real strategy and no plan B to fall back on. DeGale didn’t have answer for Groves’ movement and didn’t show a sense of urgency to move quickly to start cutting off the ring until the second half of the fight. By then, DeGale already given away some crucial rounds that he had to try and make up for. I don’t know why DeGale wasn’t adapting to Groves’ movement early, but you have to wonder whether DeGale’s trainer is the root of the problem. It isn’t like Groves was springing a surprise by showing movement in the fight, because that’s what Groves had been saying all along what he would be doing. And even with him giving DeGale a heads up, DeGale didn’t seem very prepared for the lateral movement and handled it poorly throughout the fight. Even in the second half, DeGale didn’t press the attack hard enough and seemed to fight with a lazy style. There was no jab, which he really needed to use to pick Groves off on the outside while he was moving in circles. This is something DeGale’s trainer should have been on top of. And DeGale showed Groves far too much respect until it was far too late. He treated Groves like a project that he didn’t really want to start because of how much hard work he’d have to put into it. By the time he realized how desperate the situation was late in the fight, Groves had already built up a sizable lead that forced DeGale to be almost perfect to win enough rounds to get the victory. I think DeGale might need to consider getting a new trainer after this. He needs a fresh outlook from someone that can possibly give him some new ideas so that his kind of thing doesn’t happen again. 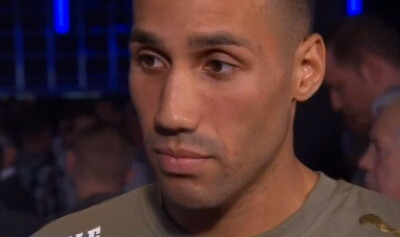 Boxing » James DeGale » Does DeGale need a new trainer?